Ziggeo can help any hackathon in a variety of ways - from introducing hackers and recording hacks to featuring videos of judges; you'll also find ideas on what to hack on, how to record great videos at hackathons, and even a Ziggeo Cheat Sheet. Record hacker and sponsor videos via Ziggeo's video API and SDKs for video recording, playback, management and hosting. 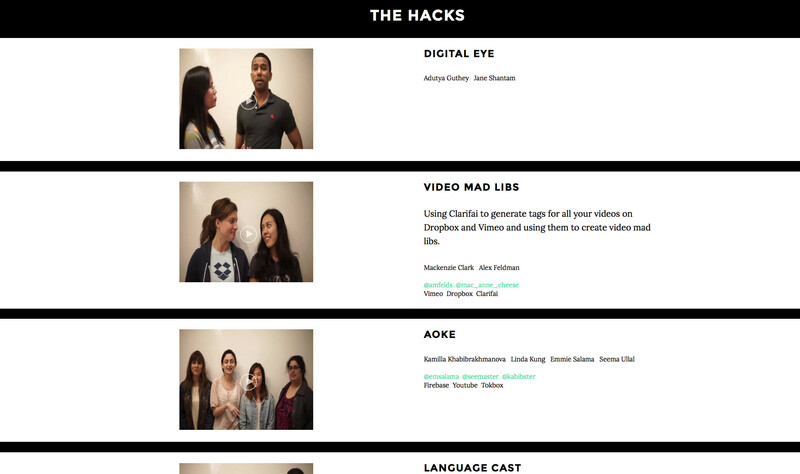 Launch videos to hackathon site, YouTube account, etc. Video Dating App : Short videos recorded and submitted : wrap a fun theme around it. Roommate App : Need an extra roommate or housemate? Have a sweet deal? Introduce your place on video and let others respond on video. Fresh Faces : Want to check out the new class before they arrive? Have them all record videos of themselves. Instant Pet Adopter : Pet adoption agencies have terrible technology. Build something they can use. Instant Pet adopter : - they record videos of pets for adoption, you respond with interest. Try-Out App : Casting for a school play or your cappella group? Need to figure out the best fit for your eating club? Students record videos explaining the opportunity and others respond on video with their songs, monologues or story. Interviewing Employers : Let employers try out for you! They record videos letting you know why you should work for them. And if you're interested, you can respond on video. Travel Journal : Record the places you go and people you meet; share with family back home. Happy 'rents : Record video messages accessible only to your parents. Birthday Bling : Let friends record birthday wishes on video. Video Greeting Cards : Record videos to be sent for special occasions. Video Reviews : Want to get the real scoop by real people? Let them record video reviews. Hackathon Idea Generator : Let folks from around the world record videos suggesting what you should build so you can put your coding time to good use. Hackathon Matching Service : Don't know who your teammates will be? Create a Hackathon matching service so folks can introduce themselves to one another before the big day. Parlez Vous Francais? : Record videos practicing a language and let others from that country respond and correct your pronunciation. Video Pals : Expand your world by exchanging video messages with those around the world. Student Admissions Vote : Be the first university to let students vote to fill a spot or two in the upcoming class. Choose a wild card. Let applicants record and submit videos for the popular vote. Ask the Admin : Students record videos asking questions : - and up vote those everyone wants answered. Admin answers questions on video. Crowd-sourcing Initiatives : Have an idea you want founded? Record a video explaining your idea. Let your classmates and alums support your dreams. They can record videos of support. Debt Busters : Up to your ears in student loans? Record a video and let alumni and friends help ease the burden. Video Art : Create an app that lets artists collect snippets of video from all around the world they can use to creat a video art piece. People record and submit videos in response to instructions. Feel Good App : Record your video and let strangers tell you how beautiful you are. Secret Crush : Have a secret crush but don't want to be rejected? Create a dating service where 2 matching likes will release video messages to one another. Morning Therapy : Wake up each morning and play a video of yourself, your family and friends saying how great you are. You'll feel empowered. Care Packages around Exams : Let family send exactly what a student wants : and let them record a video message. Ziggeo won the API:World 2017 Award for its API for Video Recording and Playback. Ziggeo won the API:World 2016 Award for its API for Video Recording and Playback.